Cape May is my family's destination vacation every summer. We have a wonderful week together soaking in the fun in the sun. I love taking my traditional walk along the beach capturing the beauty of the waves, picking up shells and reflecting upon the year. Along my walk this past August, I decided to pick a spot near the piers to sit and take in the waves. A moment of stillness to un-junk the mind. To my surprise, an unexpected encounter with a perfect stranger affected the course of my life forever. I saw this man swimming vigorously towards the dock. Where did he come from? I got nervous. The waves were huge due to a tropical storm that happened earlier in the week. I watched carefully hoping this man was not going to get hurt. 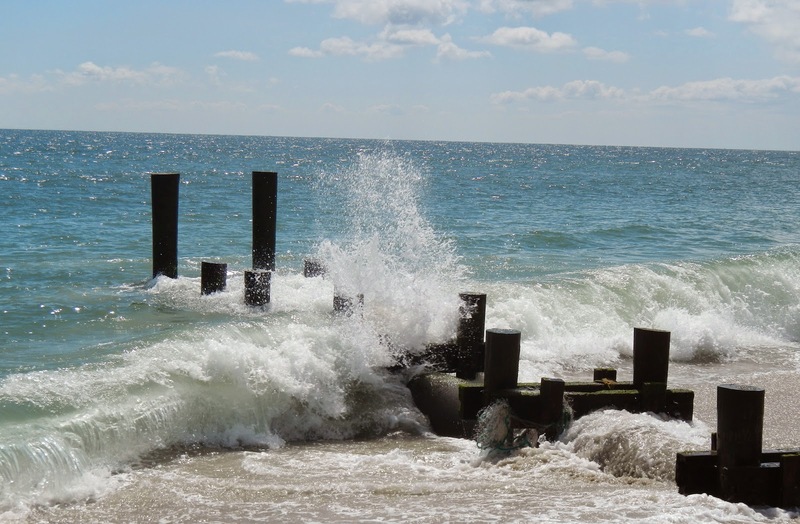 A huge wave was coming as he approached the piers….Big sigh. He swam in between the piers and then lifted himself out of the water. He was fine. Actually, more than fine. He sat there and took the moment in. He was present, giving his full attention to the sounds, the smells, the colors..
My eyes feasted on him. He proceeded to do a series of yoga poses on top of this narrow pier. He bent over and lifted his legs freely. That classic plank position that you see yoga gurus do. It was beautiful as the waves splashed underneath him. He then stood up, and lifted his arms to the sky. Pause. He turned his back and waited. What was he waiting for, I asked myself? I gasped. What is he going to do now? Oh my god. He is waiting for the perfect wave. Here it came. He flipped backwards into the voluptuous wave without any fear and then swam to shore.....I was left breathless. I was supposed to see that and learn a lesson. I was inspired. It became clear to me, high-def clear that I live my life with too much fear. I allow resistance to roadblock what I most desire. I want a more vibrant life, a more awakened life. Living an authentically powerful life - where it’s time to create what I have been thinking about for two years; my own custom-design business that enlarges the MoD Design Guru brand. Here a perfect stranger was able to open my eyes and give me answers on how to stop road blocking myself from what I truly desire to do. I am writing it down so it is in black and white and clearly sets my intentions. 1. Be present. Live in the now. Wake up. Like the stranger, he stood there and breathed in the moment. 2. Connection: connect to your heart passion. You are most powerful when your personality serves the energy of the soul, the vibrational energy of what makes you tic. If you’re creating a business, make love the bottom line and not the money. Abundance will come if you are doing what you are most passionate about. If you desire something enough, then the universe conspires to make it happen for you. 3. Meaningful strokes: To bring joy into your life, you must exercise bringing passion into everything you do. The stranger showed strength and heart when he was on that pier. He was connected in mind, body and soul. So, live life with meaning. 4. Be Open: You have to be willing and open for personal growth. If its important to you, find a way and just do it. Find your grit and will to make it happen. 5. Dream large: Toxic thinking, like I cannot do it will close you off. Your dream needs to be larger than your fear; otherwise the fear will overshadow your dream. Be more confident to look fear in the face. Make passionate choices and own the consequences. This is the only way to dissolve fear. Who cares if you make mistakes along the way. Its failure that shows you that another path is waiting for you. As for the present, I followed my heart passion and finally did it. I came home from the trip without fear. Set my intention and created my custom-design website. The universe easily mapped it out for me because I was open and truly desired it. Now, I am up to my eyeballs in beautiful work.